The Media Development Center in Hale Library is offering a class Friday, Nov. 11, for K-Staters who would like to learn the basics of using a professional-grade camcorder. The class is 9-10 a.m in the MDC, 213 Hale Library. Faculty/staff and students do not need to register for these classes. Just go to the Media Development Center the day of the class to participate. For more information, call 785-532-4921. The Zoom Q3 Handy Video Recorder is a pocket-sized video recorder that records MP4 video clips. It retails for about $200. However, students and faculty/staff can check out a Zoom at no charge, at the iTAC equipment check-out desk in 214 Hale Library. What sets this versatile video recorder apart from other similarly sized recorders is its exceptional audio quality. 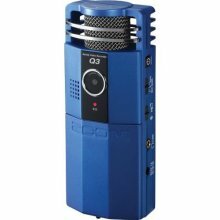 The Q3 has built-in stereo condenser microphones that provide broadcast-quality audio. The video and audio are also easily imported into a computer using the built-in USB cable or an SD card. More IT resources available for checkout, plus procedures and policies, are listed on the Media Development Center’s equipment checkout page. dotEPUB is “software in the cloud” that avid readers will appreciate. Eric Dover, Client Services manager in iTAC, recommended this free tool for K-Staters who like to save complete webpages for offline reading later — such as extensive articles, news stories, long blogs, and more. Once content is downloaded, it can be viewed by any epub-compatible device, including Kindle and other e-readers, desktop computers, tablets, the iPhone and other smartphones, iPod touch, iPads, and more. Everyone: Go to the dotepub.com website. The default is NOT to include images and links on webpages. If you want to see pictures and follow links to websites, uncheck the box “Immersive mode (no links or images)”. For more information, visit the dotepub.com website and watch the 2-minute dotEPUB video on YouTube. The Instructional Design and Technology Roundtable (IDTR) kicks off its fall series with “Tech Tools that Make Life Easy” at 11 a.m.–12:30 p.m. Thursday, Sept. 15, 212 K-State Student Union. Join us as we discuss and share tech tools that make our lives easier. We will be looking at software, apps, smartphones, and other devices that help us connect, be productive, or just have fun. Don’t hesitate to bring your own favorites, and don’t worry if you don’t have any yet! RSVP to the Center for the Advancement of Teaching and Learning (catl@k-state.edu, 785-532-7828). Coffee, tea, and water will be available, and you are welcome to bring your lunch. Join Eric Dover as he takes a look at the current state of cloud computing and examines tools that use the power of the cloud to enhance collaboration and the learning environment. We will look briefly at the definition of cloud computing and explore how it has grown into a new class of connected computing that’s transforming the way we work together, play together, and communicate with each other. Also included: Some of the current hot tools that best harness the power of the cloud and how they may assist in teaching, communication, and information sharing. Curious about what iPads can do for you? Do you already have an iPad and don’t think you are getting as much out of it as you should? If you’re looking for answers to iPad questions, come learn tips and tricks from those in the know, as we gather together some of the more avid iPad users on campus. Want to join the mobile app craze? Ever wondered if there’s some way to pull smartphones into your teaching in a meaningful way? Join Ben Ward as he guides us through a tour of mobile apps, how to build them, and how to teach with them. Don’t worry, no programming required! This annual event inspires faculty to use technology in innovative ways, share best practices with university colleagues, and interact with technology vendors. Time, location, and event details will be announced in spring semester. What it is: An online tool to store all your files such as documents, images, and videos, and access them from a central location. What it does: After creating your own Dropbox account, this free service allows you to have access to your files at your fingertips and exchange files with other Dropbox users. It is web-based and independent of the computer you are using. A quick download of the Dropbox application to your computer permits all documents to be uploaded and available in the Dropbox website. Files can be exchanged easily across Macs and PCs. Note: Internal, confidential, and proprietary data should not be shared with third-party services. See Data Classification Schema in K-State’s Data Classification and Security Policy. Also, the K-State Zimbra Briefcase allows for file storage. Do you need ideas for improving your PowerPoint presentations? Common pitfalls in creating a good presentation include things such as too many bullet points, not enough images, too much animation, complicated charts and graphs, and more. Check out Microsoft’s PowerPoint Slidefest for tips and tricks on designing better presentations.